Collect this set of hair ties for your little one and see her jumping with joy. 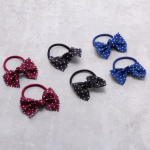 The polka dots printed bow applique looks adorable and will be loved. The elastic hair tie will give a suitable fit to her hair.